Neal Shusterman (www.nstoryman.com) is the author of dozens of books for young readers, including the National Book Award winner Challenger Deep, the best-selling Unwind and Skinjacker trilogies, and the critically acclaimed The Schwa Was Here and Downsiders. 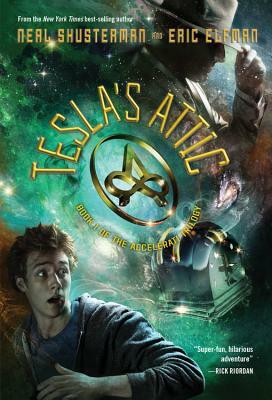 The other two books in the Accelerati Trilogy, which Neal co-wrote with Eric Elfman, are Edison's Alley and Hawking's Hallway. As a screen and TV writer, Neal created scripts for the "Goosebumps" and "Animorphs" TV series, and he wrote the Disney Channel Original Movie "Pixel Perfect". Neal has two grown sons and he lives with his two daughters in Southern California. * "Shusterman ends his provocative trilogy with a rock-solid adventure that manages to examine deep questions of faith and morality....Rich in detail, with exceptional characterization and shot through with unexpected (and very necessary) humor, this is an engrossing and thoroughly satisfying ending to a unique saga of life after death." "The shocking premise is unveiled immediately, and a nail-biting pace is sustained throughout, with the teens flung headlong into a true life-or-death struggle...these haunting debates will likely linger in the reader's mind even after the riveting plot fades...an ideal blend of philosophy and action set in a compelling futuristic landscape." "This is a wrenching but ultimately redemptive look at how pain defines us and how love, whether familial, romantic or friendly, demands sacrifice and brings gifts of its own. Once again, Shusterman spins a fantastic tale that sheds light on everyday life." "Thought-provoking and scary, invoking elements from history and mythology, the novel ends with a shocking event that will leave its fans wanting the next volume immediately." "Shusterman's novel reveals its secrets and their implications slowly, allowing readers to connect the dots before the characters do and encouraging them to weigh the price of Bruiser's gift' against the freedom from pain that Tennyson and Bronte enjoy."